This marble portrait of King George III (reigned 1760-1820) is signed and dated on the back 'From the Life / by / Jan Nost Sculp / 1767'. John Nost the Younger (1713-1780), who was born into the van Ost (van Nost) family of sculptors, was trained in London by Henry Scheemakers (1670-1748). He travelled to Dublin in 1749, and spent much of his subsequent working life in Ireland. He executed a number of portrait busts and public monuments, including a statue of George III for Dublin City Hall. His bust of the famous actor-manager David Garrick (1717-1779) was apparently reproduced in many copies. Following the death of Garrick's widow, Eva, in 1822, the contents of the couple's country villa and their apartment in the Thames-side Adelphi, London, was sold at auction in the capital in 1823. Intriguingly, the sale included a bust described as 'V. Nost, 1764. 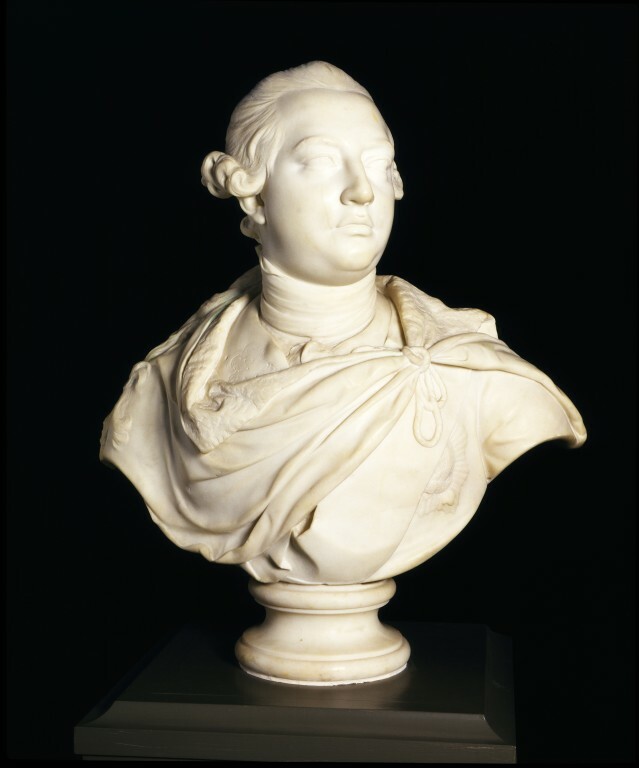 An early bust of his late Majesty, George III'. The subject looks to his half left. He wears a wig, with tresses which fall over his shoulders and are tied with a ribbon at the nape of the neck. His fur lined cloak is tied with a cord above his left breast. The garter star and sash are partly visible below. He wears a stock; and the embroidered edge of his coat is visible above the cloak. Included in the Sotheby's sale, 25 January 1957, lot 50, the property of the late Darcy Edmund Taylor Esq. Bought for £140 from Frank Partridge & Sons, Ltd, who bid on the Museum's behalf at a Sotheby's sale, and secured the bust for the stated price.